Introduction: There have been many previous studies of the Carolingian army, but none examining the ninth-century armies which faced the Viking invasions. Earlier works have tended to focus on the age of expansion in the eighth century, particularly the capitularies and campaigns of Charlemagne. Yet the armies which fought Charlemagne’s offensive campaigns differed significantly from those which defended the Empire against the Vikings in terms of their composition, size, armament and purpose. The present study will thus begin by considering the different types of defensive force which opposed the invasions: the host, the coast guard and the lantweri. The royal army has naturally been the focus of previous studies, but against the Viking incursions the initial line of defense was the coastal guard, both at sea and on land. Another form of resistance was that offered under the lantweri, the defense of the realm in case of invasion, which was obviously of primary importance against the Vikings, but which has been accorded scant attention in the past. The article will then turn to three more general issues: the size of the Frankish armies which fought the raiders, the leadership and muster of those armies, and the particular role played by the cavalry. The final three sections will address the range of military tactics employed against the Northmen: the strategy of containment, by which the Franks attempted to confine Scandinavian fleets to the rivers; siege warfare; and finally pitched battle. Throughout the study a more fundamental question will also be kept in view, namely, why it was that the all- conquering war machine of Charlemagne’s time apparently found itself unable to deal with the Scandinavian incursions barely half a century later. After a long period in which the only interest shown in Carolingian military matters was in the form of short survey articles, two significant recent books have turned the spotlight on warfare in the Carolingian period. The first, by Bernard Bachrach, considers the Frankish military in considerable depth, though again it concerns itself primarily with the eighth rather than the ninth century. The second is Guy Halsall’s important survey of warfare and society in the early medieval period, including discussion of the ninth century and paying particular attention to the Viking raids. However, the fact that Halsall discusses a 450-year period across the whole of Western Europe allows the present study to go into detail where he uses a broader brush; and the conclusions reached here will frequently complement those in his work. As for earlier studies of the Carolingian army, a valuable detailed survey can be found in a bibliographical article by France published in 2001, though as was noted earlier, the great majority of these sources concentrate on the era of Charlemagne, The occasional references to the struggle against the Vikings in these previous works tend to be brief and relatively superficial. One incident which has received unusually close attention is a battle between Franks and Vikings at the Dyle in 891, whose significance for the role of cavalry will be discussed below, but this is a rare exception. The present study is consequently long overdue. 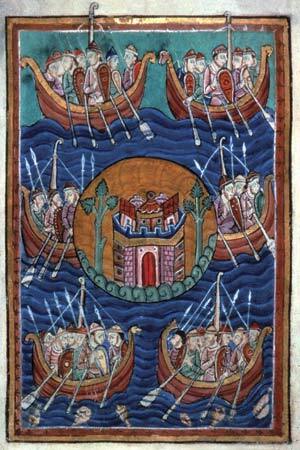 It should be emphasized that this article will focus exclusively on the armies which opposed the Viking invasions; broader defensive strategies employed by the Franks, such as the fortification of bridges, the payment of tributes and the hiring of Viking leaders as mercenaries, have all been discussed elsewhere, as has the role of the church in resisting the invasions.